In these days, the main problem faced by marketer’s is the Bounces and Complaints while sending mails. 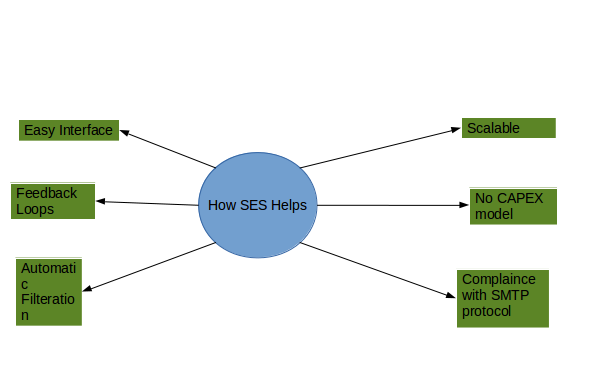 Where SES helps you to analyze complaint emails and bounces. These issues are mainly caused by attempting to send to a non-existent recipient; complaints arise when the recipient indicates that they do not want to receive your message. Amazon SES forwards bounce and complaint notifications to you by email or sends them to an Amazon SNS topic, depending on your configuration. Amazon SES lets you send email marketing and transactional emails to customers in a quick way and cost-effective manner. Through a simple API call, you can now access a high-quality, scalable email infrastructure to effectively communicate to your customer. SES is an email delivery service for bulk and transactional system. IT supports both SMTP and API based access and it offers endpoint to receive information on email delivery. SES helps in business because it has automatic filtration, feedback loops, easy interface and scalable also. Authentications like DKIM signing exists and SPF exists. DKIM ( Domain Keys Identified mail) allows senders to sign their email messages and ISPs to use those signatures to verify that those messages are legitimate and have not been modified by a third party in transit. DKIM signing helps in the deliverability of email messages and ISP can verify the sender’s domain for authenticity. DKIM in SES can be set up in 2 ways a) Easy DKIM using the SES consoleb) manual DKIM signing by using the SES REST API. SES offers endpoint to handle bounces and complaints. SES can be configured to handle errors in the following ways a) SNS b) Email forwarding. 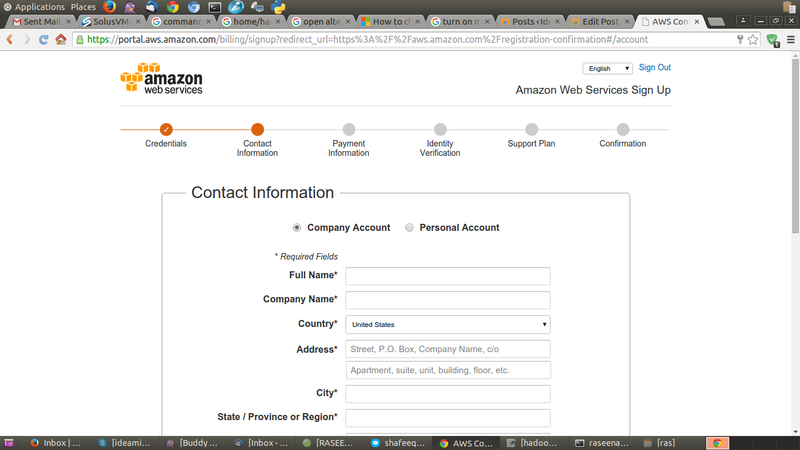 Assume that you have a web application, which is using the AWS SES to send emails. 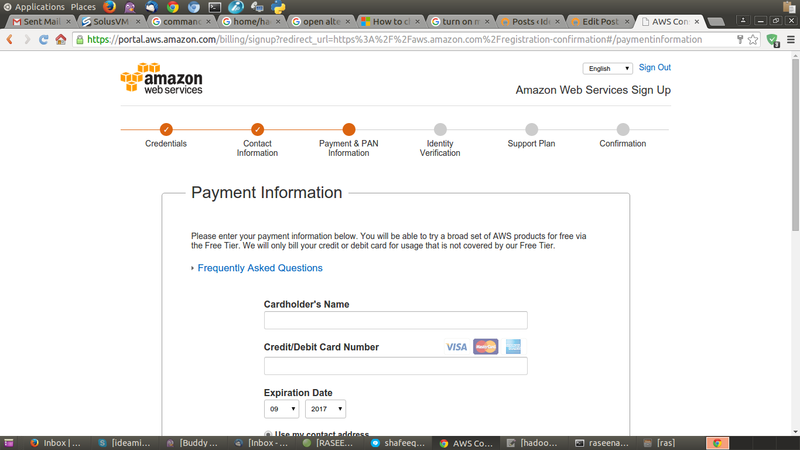 Before sending, we need to do the queuing using the SQS (AWS Simple Queue Service‎) queue service. So we are sending email to simple queue service and SQS is sending email to SES and SES will send to the external receiver. 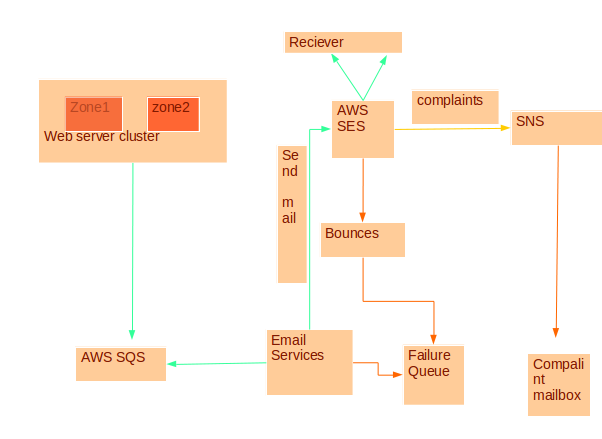 Whenever the complaints arise the AWS SNS sent a notification to our complaint mailbox. SES is a cost-effective email delivery service. Being cost effective makes it attractive for spammers. SES evaluates your reputation on the basis of bounce percentage, complaints received and quality of emails. SES takes these parameters seriously and can block production access when SES service is abused. As long as the bounce percentage and the quality of emails are good, SES is a cost-effective service for mailing. a) Authentication: It makes sure that you own the email address, where you are sending from. Aws supports all types of authentication like DKIM, SPF and DMARC. b) High Deliverability: Amazon SES maintains a strong reputation among mailbox providers by filtering spam and malicious content. c) Dedicated IP Addresses: Basically, Amazon sends email through the shared IP address, but the customers who are sending large volumes of email can lease dedicated IP address for their exclusive use. d) Monitoring: Amazon SES can capture information about the entire email response funnel, including the number of sending, deliveries, opens, clicks, bounces, complaints, and rejections. This data can be stored in an Amazon S3 bucket or an Amazon Redshift database, sent to Amazon SNS for real-time notifications, or analyzed using Amazon Kinesis Analytics. e) Sender Reputation Management:: You can use CloudWatch to create alarms that notify you when your bounce or complaint rates reach certain thresholds. With this information, you can take immediate action on issues that could impact your sender reputation. f) Flexible Email Receiving: The accepted email can be stored in Amazon S3 bucket. g) Multiple Email Sending Interfaces: Amazon provides many interfaces to send emails like AWS Command Line Interface (AWS CLI), or by using an AWS Software Development Kit (SDK). h) Mailbox Simulator: You can use the mailbox simulator to simulate successful deliveries, hard bounces, out-of-office responses or complaints. 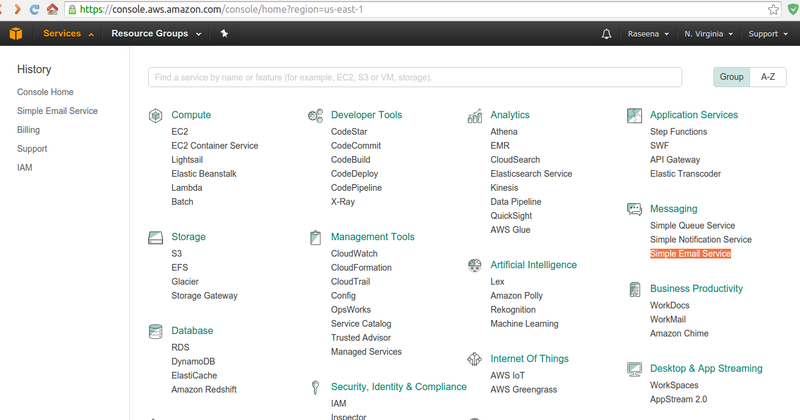 i) AWS Integration: Amazon SES integrates seamlessly with other AWS services. a) Cost: AWS SES is budget friendly. According to the service cost, Amazon SES appears to be the king here. This service charges a whopping $ 0.10 per thousand emails which is the lowest among all other email sending services. You may check the AWS SES pricing here SES_price. b) Deliverability: Amazone SES has its own filtering technologies, where it scans the email and ensure that the email meets the ISP standards. SES automatically blocks the emails which have malicious and spam contents. c) Sending Statistics: SES have statistics of successful deliveries, rejected messages, bounces and complaints. Real-time statistics are available in AWS console. d) Reliability: SES can be integrated with different applications through SMTP interface. e) Quota: For new accounts in the sandbox, the quota is restricted to 200 emails per day, therefore one should request production access as soon as he/she creates an account. 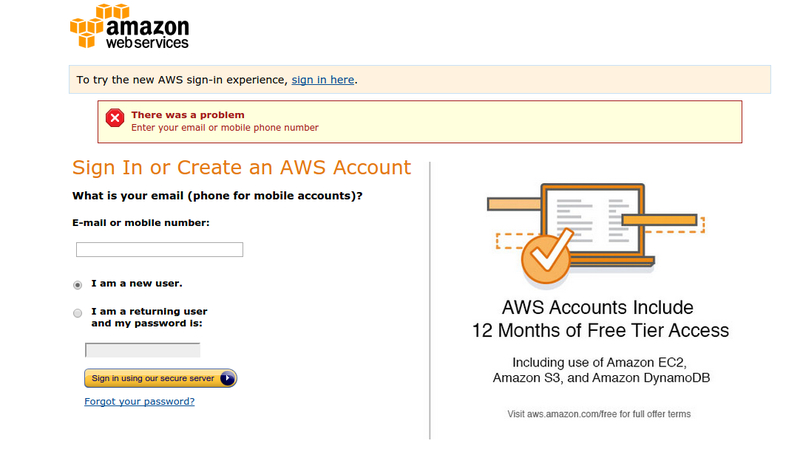 Default quota for emails via Amazon SES is 10000 emails/day after you are granted production access. Now if you send high-quality content and shoot nearly 10000 emails every day, Amazon SES detects your utilization and increases your current limit by itself. You don’t have to send any new request or something, your quota is modified by Amazon SES as per your requirements automatically. f) Notifications: Amazon SES can send them to you by either an email or through Amazon Simple Notification Service (Amazon SNS). g) Scalability: Amazon SES is highly scalable. When we load the AWS page. It will prompt for either to login or register. 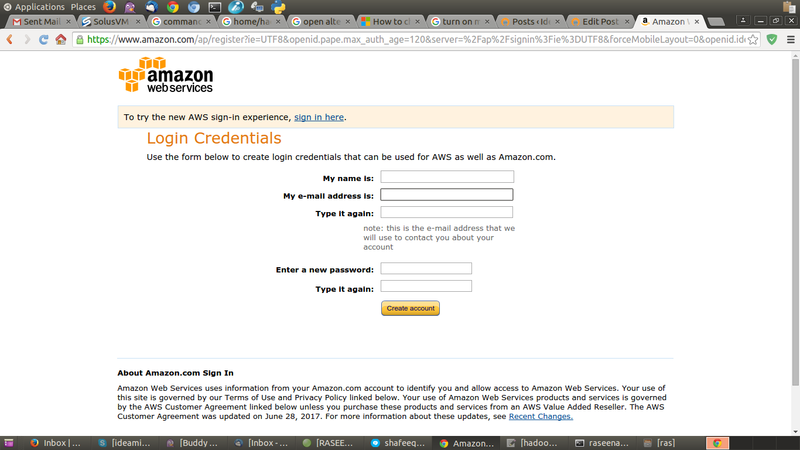 Click on the ‘Create an AWS Account’ as shown in the picture. As you are a new user, select ‘I am a new user‘ option and enter the email id or the mobile number and click on ‘Sign in using our secure server‘. Enter the name, email address, and password. Enter your full address, phone number etc.. Here you have to enter your credit card or debit card details including card number, expiration date, cardholder name. After that, you can choose your billing address, either it can set as same as contact address which we have entered earlier or can use a new address. 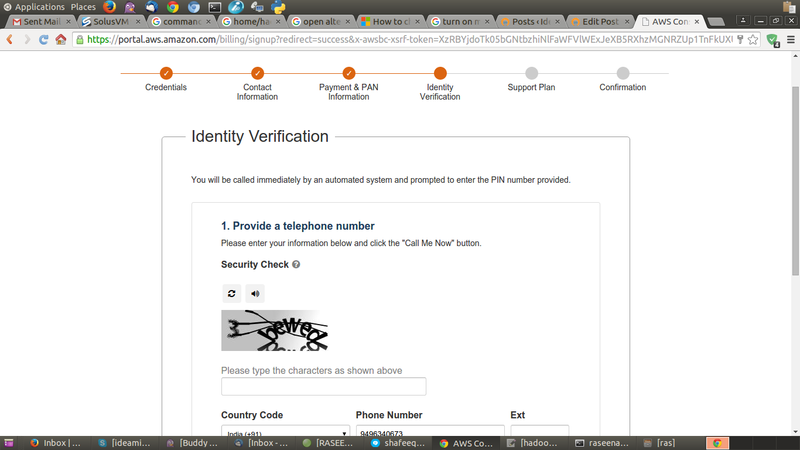 In this identification process, you need to provide your phone number and to click on “ call me now” button. It will show you a 4 digit verification code then. You have to enter the code through phone when the call came. 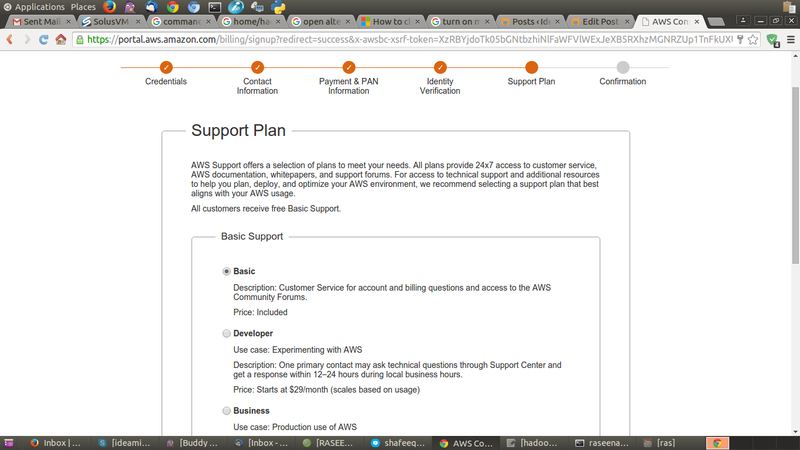 Step 7: After that continue to select the support plan by clicking the button “continue to select your support plan”. Step 9: Confirm the process, when it asks you to confirm and click on “ Launch Management Console” button to log in to your account which is created now. 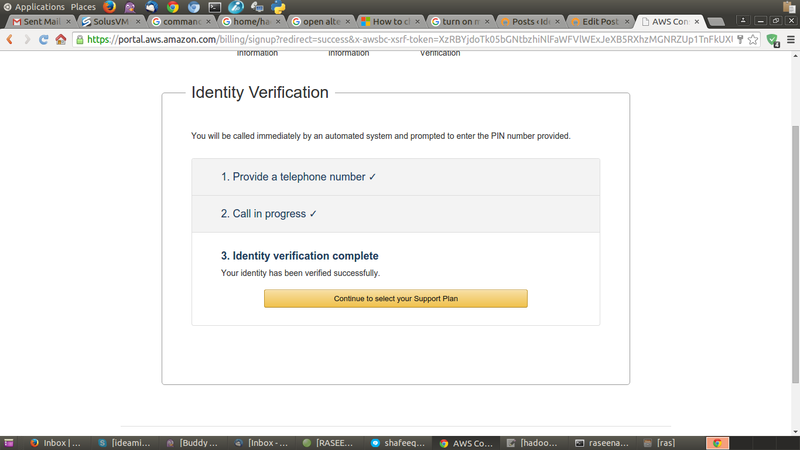 Step 10: Now you have successfully created your AWS account, you are able to use the SESservice now. 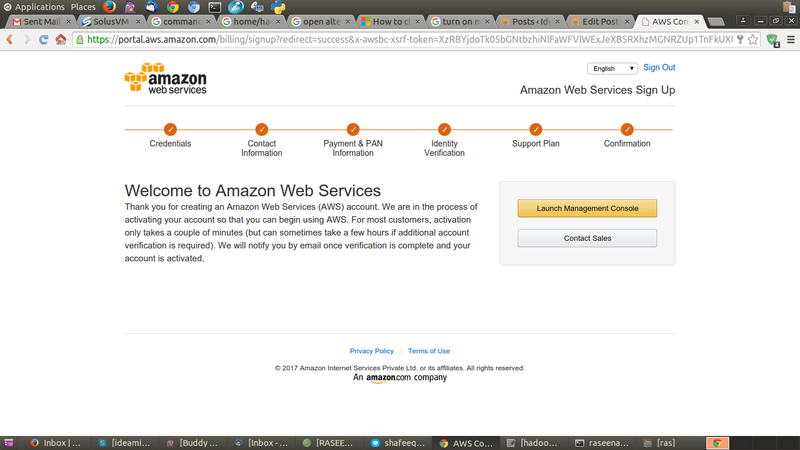 Please move to the “services” tab in upper left corner in your AWS console and click on “Simple Email Service” option. Step 11: Here you can see the SES Homepage and all its other services. Here you can verify the desired email id or domain, which you are going to use for mass mailing. Here I am going to verify my email id, So I clicked on “Email Addresses” under Identity Management. 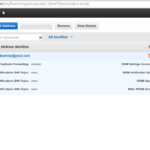 AWS SES is the best solution for everyone who needs a reliable, scalable and inexpensive way to send or receive email. Amazon SES can reliably deliver merchandising, subscription, transactional, and notification email messages. 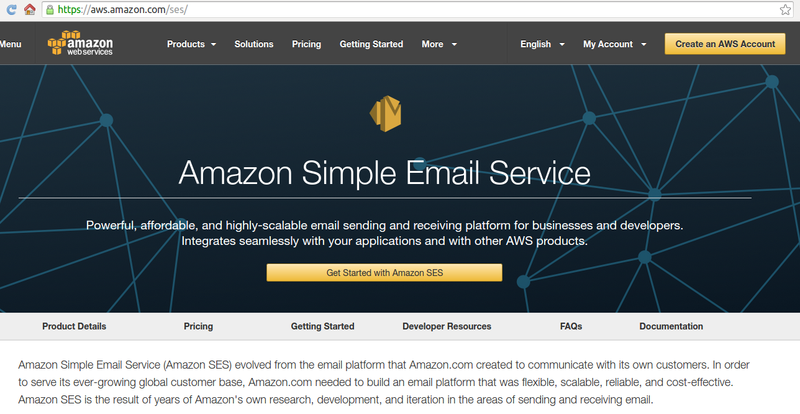 Amazon SES eliminates the complexity and expense of building an in-house email solution or licensing, installing, and operating a third-party email solution. As far as the cost of using this service is concerned, Amazon SES appears to be the leader here. This service charges a whopping $ 0.10 per thousand emails which is the lowest among all other email sending services.